Numerical Weather Prediction (NWP),is a computer simulation of the atmosphere and the basis of all forecasts used by sailors. Weather forecasting is inits third phase. For thousands of years single observer forecasting was the only possible tool. From the late 1850s, the synoptic approach let forecasters "look" at the weather as plotted and analysed on charts. They learned how to interpret and predict but only in a subjective manner. The third phase is the era of large computing systems and satellite observing technologies. This has made possible the development of NWP. Short wave, visible and UV radiation from the sun passes through the earth's atmosphere and heats the surface. The earth loses heat by conduction, convection, radiation (long wave, IR) and by latent heat effects. Heating and cooling of the earth varies with time of day, time of year, latitude and nature of the surface. Differential heating ��..> temperatures differences ��> pressure differences ��> winds. Air movement ��> redistribution of pressure ��> changes in winds. Contact with cold ground ��> cooling. Cooling ��> condensation ��> release of latent heat. Further cooling ��> freeze and ��> more latent heat. These effects warm the air. Snow falling through warmer air melts ��> cooling. Rain falling through dry air evaporates ��> cooling. These latent heat effects ��> temperature change ��> pressure changes ��> wind changes. Cloud reflects solar radiation back out to space. Cloud absorbs radiation from the earth and re-radiates it back to earth and out to space. 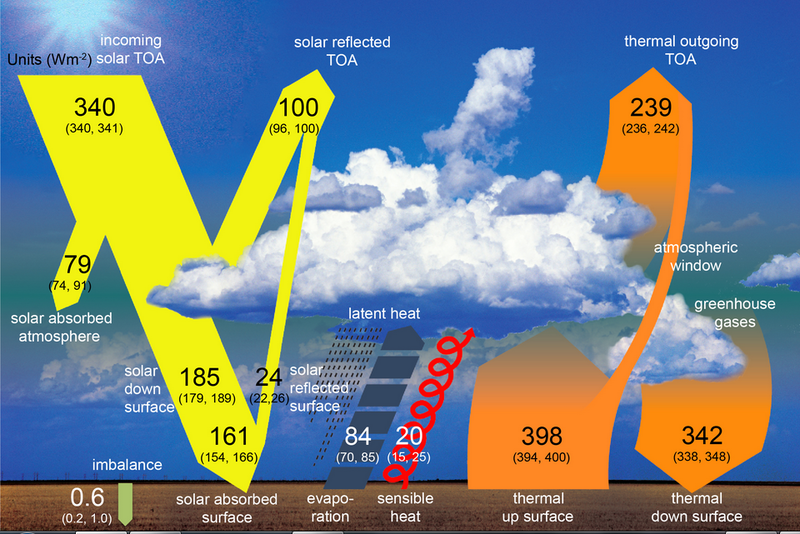 Some of the infra-red energy radiated by the earth is absorbed by greenhouse gases. Topography affects weather on all scales. All these processes can be expressed in mathematical equations. At the centre of these equations is one that says, in effect, that applying a force results in change � acceleration or deceleration. This is Newton�s third law. There are always forces in the atmosphere � gravity, the Coriolis effect and pressure gradients. Consequently, there is always change. Pressure gradients are always changing so that the atmosphere is always in a state of flux. Physicists call weather forecasting an initial value problem. At the initial time, T=0, the rates of change of each weather element can be calculated. That allows estimates to be made a short time, a few minutes, ahead, of winds, temperatures, pressures, water vapour and liquid water. These new values then provide a starting point to calculate for the next few minutes. The start of any weather forecast is an analysis of current conditions. There are many sources of data used in NWP and these have different characteristics in the way they represent the atmosphere. There are differences in accuracy, resolution, amount of data of various kinds and differences in times when the measurements were made. Bringing all these data together cannot be done precisely. There will always be uncertainties in the analysis detail. After analysis, the forecast calculations can begin using massive computers such as this one used by the ECMWF and the U K Met Office and capable of thousands of billions of sums per second. However, even that power is miniscule compared to the atmosphere. Many approximations have to be used and many terms are estimates. One of the �approximations� is to represent the atmosphere by values on a 3-dimenional grid. 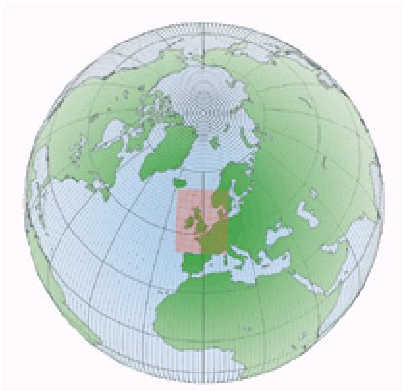 The UK Met Office global grid (2017) has a spacing of about 11 km, 0.1 degree lat/lon in the horizontal. There are 4,916,200 grid point with, 70 levels at each from about 20 m to 80 km above the surface of the earth. A limitation of any Grid is that shapes of weather features and topography can only be defined on a size of about 4-5 grid lengths. The UK Met Office runs its global NWP models on a 6-hourly basis. Forecasts for the first 6 hours of the last run are combined with all the observational data received over that period to produce the starting point for the next forecast. In order to meet deadlines, there has to be a data cut-off time. Data arriving after that time are used later to re-compute the first 6 hours� forecast so getting the best start possible for the following run. Limited area or meso-scale models are run in the same way. All this is on a �best endeavours� basis and users should always bear in mind the limitations to forecast accuracy. Chaos is always a problem � it has been suggested that a single butterfly flapping its wings could lead to major weather systems. In fact, it cannot but small disturbances can and often do grow into large ones. There are always uncertainties in detail of weather analyses. These lead to uncertainties in the deterministic forecast. Model ensembles are a way of tackling this problem. After running the forecast model, small variations can be put into the analysis that are compatible with the original data. The forecast can be run many times and a spread of results obtained. The spread of these indicates the degree of uncertainty in the deterministic forecast. The amount of information that can be provided is enormous and access by users will become an increasing problem. How many sailors will have the ability to assess outputs from an ensemble? How many will want to spend the time needed to do so? When will high speed communications become affordable for access over radio systems? One thing is certain and that is that the written or spoken word will not and cannot cope with all the variations in the weather that exist, whether they are well forecast or not. In addition, the effects of random events such as volcanoes can be studied. For seasonal up to decadal prediction the effects of El Ni�o and La Ni�a can be investigated. Weather Forecasts for the Sailor. Why do we pay for forecasts? The Internet has a wealth of pages of varying degrees of complexity. Try putting �numerical models" into the Met Office page search engine. Then do the same with Google.